Businesses fight to upgrade their technology. But how much energy is put into innovationing social technologies, corporate culture, and employee capacities? Why are so many large businesses confounded by digital transformation? How do you plan to lead your teams and organization in our digital 21st Century? With 20th Century practices? Businesses fight to upgrade their technology. But how much energy is put into innovating social technologies, corporate culture, and employee capacities? Why are so many large businesses confounded by digital transformation? Let’s face it. A lot can happen in a digital day. You barely find any time to upgrade your leadership skills and yet it is imperative. to leverage fresh insights and cutting edge training. 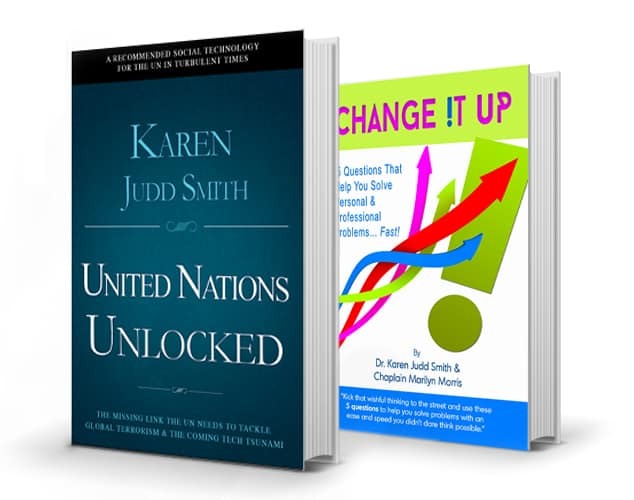 Karen Judd Smith is an international speaker, #1 best-selling author, and a international advisor bringing a whole new approach to assessing keys to leadership as technology increasingly leverages the current strengths and weaknesses of our humanity. Because we are social and tool wielding animals, we have the chance to unlock remarkable innovation just as we can unleash untold horrors. But it does require effort and intent. Our social institutions—public, private, and civil are critical parts of this puzzle. It is not only the United Nations that can, and needs to be unlocked. If you would like to invite Karen to keynote your event, call 209-920-7088 or send us an email.